The Delhi Sikh Gurdwara Management Committee received a major jolt today when its Dharam Prachar Committee chairman Tarsem Singh joined the Prachar Committee of the Shiromani Gurdwara Parbandhak Committee. In a significant development, Akal Takht Jathedar Joginder Singh Vedanti gave a clean chit to DSGMC president Paramjit Singh Sarna in the Dera Sacha Sauda controversy. While defending Sarna, Vedanti said that he could not be summoned to the Akal Takht for having met Dera Sacha Sauda chief on the basis of media reports. 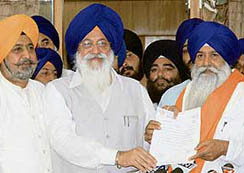 Former MP and advocate Raj Dev Singh Khalsa criticised the SGPC in failing to make any city in the state tobacco-free, despite the fact that three major takhts - Anandpur Sahib, Amritsar and Damdama Sahib - of the Sikhs are situated in the state. The chief judicial magistrate here today remanded B. I. S. Chahal and his alleged aide Baldev Singh Dhillon in 14 days’ judicial custody. The accused were presented in the court at about 4 pm today as the term of their police remand expired. A prolonged debate on points of law regarding the grant of bail, marked by Justice Ranjit Singh’s incisive queries, dominated the hearing on former Punjab Chief Minister Capt Amarinder Singh’s anticipatory bail plea today. The Punjab information commission will provide justice to applicants at their doorsteps. The state information commissioners will go to the district headquarters twice a month to give on-the-spot decisions on complaints of residents against denial of information by information officers. The BJP will contest 35 seats in the elections to the municipal corporation of Jalandhar. It will contest almost an equal number of seats in the municipal corporation in Amritsar. The remaining seats in both corporations will be contested by the SAD. To enable the people of Punjab to undertake comfortable journeys, the Punjab Transport Department is all set to strengthen its existing 1,200-strong Punjab Roadways fleet of buses by adding 300 buses to it. The Bahujan Samaj Party (BSP) will go it alone in the elections to five Municipal Corporations of the state to be held next month. 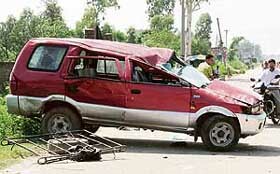 A Tavera car carrying six Amarnath pilgrims overturned this morning on the Jalandhar-Amritsar highway under Maqsoodan police station resulting in the death of four of them. The bandh call given by the local unit of Bajrang Dal completely fizzled out today. The call was given in protest against police authorities for not registering a case against the activists of the Ambedkar Sena under Sections 295 A, 307 and 452 of the IPC. A number of NGOs, including the Consumer Movement, today expressed concern over the proposed closure of the sub-post offices on the DAV campus and in the Sahitya Sadan complex. Official sources said the step was being taken to cut down expenditure and fill vacancies in the main post office here. Chairperson of the National Commission for Safai Karamcharis Santosh Chowdhary has condemned the uncooperative attitude of government officers of the district at the alleged behest of chief parliamentary secretary Mohinder Kaur Josh. Acting on a report submitted by Dr Indu, ADC, Sangrur, Deputy Commissioner S.R. Ladhar has suspended a resolution passed by 11 councillors and associate members of the local municipal council regarding election of Sabran Bhapp, a Congress nominee, as vice-president of the council. Ajit S.Puri, a senior consultant with the Mohan Dai Oswal Cancer Treatment and Research Foundation, Ludhiana, has written a book, “Bird Flu: Countering the Terror.” He presented the first copy of the book to chairperson of the United Progressive Alliance Sonia Gandhi at her residence on Saturday. Life in Mukerian town was thrown out of gear today following a bandh call by various Hindu organisations including Sanatan Dharam Temple Committee, Dhanoya, to protest against the district administration for pressing it to register a case against Bishan Singh, sarpanch of Dhanoya, under Section 295 A of the IPC, cancel the auction of temple land and dismissal of the village panchayat. A large number of farmers, led by Lehragaga block president of the BKU (Ugrahan) Balbir Singh Jhaloor, today became instrumental in stopping the auction of the land of a farmer Leelu Singh at Ballran village near Moonak. Ferozepur, July 16 Traders of the cantonments falling in the state are a harried lot. Despite the abolition of octroi in other parts of the state, these traders still have to pay huge sums of money towards octroi. Social worker and educationist of this region Raj Gupta has been awarded “shiksha rattan puraskar” by the India International Friendship Society for her contribution in the field of education and social service. Around 600 illegal jhuggis were razed here today. Around 400 to 450 jhuggis at Haveli Kalan village and 100 to 150 jhuggis in the locality between the bus stand and the secretariat were razed under a team headed by SDM Kavita Singh. The structures included liquor vends, kiosks. A medical camp was organised by Marian Health Centre, Kauli, here today. A. C. Varma, managing director of State Bank of Patiala, inaugurated the camp in which about 350 patients were examined by a team of doctors from Patiala, Rajpura and Ambala. The representatives of the bank distributed medicines to the patients free of cost. HDFC Bank, Patiala, maintaining its old tradition of working for the social cause, organised a blood sugar testing camp for morning walkers of the Baradari Gardens here today. ‘Payavaran Chetna Andolan Ki Anivaryata’, a book on environmental pollution, authored by Dr Charanjit Singh Nabha, won the first prize in a programme organised by the Central Pollution Control Board. Taking note of The Tribune report on former Hoshiarpur DFO R.R. Kakkar signing an MoU with the NGO headed by his wife, the Punjab government today initiated an inquiry into the matter. Following the instructions of health minister Laxmikant Chawla, the Patiala civil surgeon and officials of the CIA conducted a surprise check on a chemist’s shop. The team seized a huge cache of drugs, which were being misused by the chemist. MLA from Moga Joginder Jain was today detained on the order of the enforcement directorate. He was taken away by a team of the Punjab police from Punjab Bhavan in Sector 3 here. The Baba Farid University of Health Sciences has allegedly been fleecing students applying under the non-resident Indian (NRI) category. These students have to shell out Rs 67,000 for applying for the medical course in colleges of Punjab. The candidates who are residents of the state, but applying under the NRI category, have to pay the same amount. The authorities at Guru Nanak Dev Dental College and Research Institute, Sunam, today expressed their inability to admit students to Master of Dental Surgery (MDS) courses for the current academic session due to paucity of funds. The college has been facing a financial crisis following withdrawal of category III and IV of the NRI category seats by the state government and very low fee structure for MDS courses. The Punjab Anganwari Workers' Union has decided to intensify their agitation in support of their pending demands by holding protests across the state from August 7 to 15.